Rising social development generates the very forces that undermine further social development. … Success creates new problems, solving them creates still newer problems. You might translate that into: the solutions of the past tend to become the problems of the future. And I am convinced that we must find ways to factor this reality into the innovation policies we devise. In the previous post, I have already focused on innovation policy that embraces novelty, especially tailored to novel supply and novel demand. Today, I’ll look at the necessary complement that addresses the area of known supplies and known demands. Here, innovation policy must strive to avoid unintended consequences of new policies, while mitigating the undesired outcomes of previous policies. You could view this as a backward looking innovation policy, in a very positive sense: we need to look into the rearview mirror to understand the mistakes of the past in order to devise better policy towards the future. And of course we must deal with the challenges that earlier policies have left or even created for us. 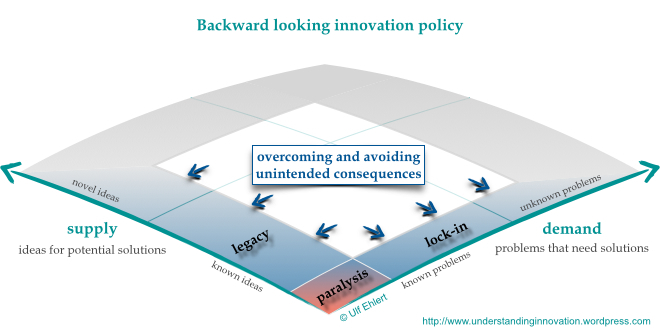 The innovation policies of the past have effectively defined today’s first quadrant of the innovation landscape: today’s business as usual embodies the intended and unintended consequences of society’s past policy decisions. In this area, there are essentially three challenges, which are partially interrelated: institutional legacy, technology lock-in, and innovation paralysis. Each of them is the undesirable and unplanned result of otherwise well-intended policies. I’d argue that we must learn from the mistakes of the past in order not to repeat them in today’s innovation policy that will shape the future of the innovation landscape. Hence, let’s think about policy objectives to overcome each of those challenges. Today’s known demand for innovation of course was unknown territory at some stage in the past. It is therefore quite likely that some institutions have been established to support and enable the cutting edge of those days. The concept of granting privileges to innovators is well-known: to encourage them in the pursuit of their ideas, to ensure that the investments of the successful innovators will be reimbursed, ideally with a healthy interest rate. Royal privileges and patronage have been employed for centuries, and the patent system as we know it today still is rooted in the same purpose: ensure the economic viability of innovation, especially during its initial phases. For the future, policies that are intended to promote specific innovations should make sure that granted privileges have a well-defined sunset clause. It will usually be quite a challenge to anticipate or predict the point in time when a fledgling innovation does not need such protection any more. Hence, and at the very least, we should be smart enough to design policies with built-in review cycles to avoid automatic perpetuation of economic privileges that are intended only as a temporary benefit. Similar to the demand, today’s known innovation supply arose in the past as novel ideas. These ideas evolved over time to shape the technologies we know today. It is an essential part of the nature of technology that it is path-dependent, i.e., any new technology builds on previous technologies. If such a new technology is sufficiently mature to be ready for use, it can enter the market. And if it offers some added or novel functionality that consumers are interested in, the technology is likely to be adopted and to gain some market share. All of that is an incremental process that is barely perceivable. Only after some time do users realise that they have adopted the new technology and gotten used to its benefits; they appreciate the additional tools and services that are developed around it; they might even have acquired new skills to fully exploit the technology. That is the moment when they are on the hock: the total cost of change is prohibitively high for the user to actually adopt a different technology. Think about Windows as an operating system. It was a real innovation at one point in time, and became the dominant solution for PCs. But its success was not just due to its own superiority. Rather, it dependended upon of myriad of ancillary products that used Windows as an underpinning. Lots of other technologies (in this case: software programmes) were developed with Windows as their backbone. These programmes of course fulfilled user demands, and at the same time their adoption further increased and secured the market share of Windows. At that point, the users wouldn’t want to change to a different operating system just because they’d have to change “everything else” at the same time: the total cost of change had gotten too high, the technology was locked in. It’s no surprise that business is interested in achieving technology lock-in, i.e., the lock-in of my technology as the new standard so that my competitors are forced to accept my rules or leave the market. That generates economies of scale that drive down my production cost and increase my margin. From a business perspective, that is efficiency par excellence: once my technology dominates the market, my superior margin ensures that any potential rival technology cannot compete with my prices. That is the moment when the micro-economic interest runs counter to innovation, when business effectively works against society’s interest. Business will always seek to enjoy the benefits of a dominant market position, ideally of a monopoly, for as long as possible, which neglects or even undermines society’s innovation demand. Of course policy cannot change the nature of technology, and technology lock-in will inevitably occur. But policy should avoid establishing institutions (e.g., regulations or long-term patents) that reinforce the natural lock-in trend. Businesses anyway have a strong incentive to establish their (ideally proprietary) technology as the de-facto industry standard in order to increase market share and revenue. If policy was to support this interest, it would actually foster the creation of monopolies. The opposite is appropriate: anti-trust laws are a good tool to ensure that the micro-economic interest of businesses does not gain the upper hand over society’s need for innovation. Institutional legacy and technology lock-in are two separate issues, and each by itself is challenging enough, as each will slow down innovation activity. Now consider a situation where legacy and lock-in occur in parallel: the result is a sclerotic arrangement of mutual reinforcement that will effectively bring innovation in that market sector to a grinding hold. Of course such a situation will tease entrepreneurial activity to challenge the entrenched market incumbent, and the advocates of market freedom would leave it to disruptive innovation to shake things up. However, there is room for policy action to support such disruption by revoking the institutional support to the dominant player. But that’s a question of economic school of thought, and that is only relevant if innovation paralysis (or call it innovation arrest) actually occurred. More importantly, I’d suggest that innovation policy carefully avoids perpetual institutional privileges. Instead, privileges should come to an end before lock-in occurs. Again, that is difficult to anticipate, but it is the best way to ensure that business interest and society’s interest remain reasonably balanced. Institutions and lock-in both make innovation accessible to economy, so that ideas (innovation supply) and problems (innovation demand) can be exchanged and traded. Without this link into the economic dimension of society, the concept of innovation as an investment would be unthinkable. However, that comes at a price: society is in a constant struggle to maintain a level playing field for challengers and incumbents alike. That balance is what innovation policies should achieve. Ian Morris wisely observed that, despite our best intentions, we cannot predict every outcome of our actions and decisions. All the more, we must strive to minimise the occurrences and severity of unintended consequences, while maximising our ability and capacity for dealing with them. Innovation policy therefore should be crafted in the understanding that there is no static end-state to be achieved. Rather, society is in flux, sometimes like a glacier, sometimes like a revolution. We are fully aware of that historic reality, and I believe we must draw the right lessons as we set the conditions that will shape our future. What better place to start than our innovation policies? Ignorance - curse or bliss?